You are here: Home / Blog / Easter / Don’t Finalize Your Easter Set List Until You Read This! Easter is a day of celebration! When I read the story of that Easter morning my pulse quickens as I see Peter and John running to the tomb and hear the joy in Mary’s voice as she recognizes Jesus. It’s a day of celebration and our songs should reflect that. I’m all for a quiet moment in the service, but on Easter Sunday start and end your service “BIG” (and by that I mean with upbeat songs of celebration). On the way to church this past Sunday I was teaching my kids the classic hymn, “The Old Rugged Cross”. Our worship style at The Journey is very modern, but I grew up on the classic hymns and look for ways to integrate them into our worship service as much as possible. And while I love “The Old Rugged Cross”, we won’t be singing it on Easter Sunday. Why? Because Easter Sunday isn’t about the cross . . . it’s about the empty tomb. Sing about the cross the next two weeks leading up to Easter (and especially on Palm Sunday) but on Easter Sunday choose songs that celebrate the Resurrection and the new life we have in Christ because of it! Easter Sunday is not the day to try out those 5 new songs you’ve been waiting all year to sing. Easter Sunday is a day to sing worship songs that the people in your congregation know by heart. Why? Because your church will be filled with First Time Guests. Let me explain. If you choose songs that your congregation already knows you will keep your congregation connected to the the worship set. AND because the people around them are clapping and singing your First Time Guest will feel more comfortable clapping and singing as well. On Easter, sing some of your church’s favorite songs of worship. And if you want to do a new song, teach it in the weeks leading up to Easter so your church will know it. Put yourself in the shoes of a first time guest at your church on Easter. They will enter your service uncomfortable (could be the suit and tie) and unsure of what to expect. They will be asked to stand and sing songs they don’t know. So be kind to your First Time Guests . . . choose a song that they are likely to know. Sing a hymn like “Amazing Grace”. Or you may perform a popular radio song that ties in with Easter or your message series. However you choose to do it, help your First Time Guests experience something familiar on Easter Sunday. It will go a long way toward taking the edge off and helping them relax for the rest of the service. This is a big time mistake that some worship leaders make… and I can understand why. Easter is a BIG DAY, so the tendency is to pull out all the stops, bring in the guest worship leader, the big lighting show, or even the guest orchestra for your Easter services. But what happens the NEXT SUNDAY when the people that you reached on Easter Sunday come back expecting to hear the guest worship leader or orchestra but only find a guitar, piano and vocalist. Easter is the PERFECT day to do your very best NORMAL service. Go all out and make it great… just make sure you’re able to replicate what you do on Easter in the Sundays that follow. Be who you are, prepare in advance and present the Gospel in the very best way that you can. And remember, the results aren’t up to us anyway. Praying that you have the best Easter ever! PS – I hope you enjoyed today’s leadership lesson. The topic actually came out of a Q&A session I did with one of my coaching networks. Every month for ONE FULL YEAR, I personally coach a select group of Worship Pastors in a 90-minute video call. And I want you to consider joining! The Worship Leader Coaching Network is designed to help you develop your leadership ability, double your worship team, create life-transforming services, lower your stress, maximize your time, raise new leaders, and lead your ministry at the highest level. I want to invite you to join my NEW 12-month systems-based Worship Leader Coaching Network! You see — we all face seven common challenges as Worship Leaders. And the solution to overcoming these seven challenges is seven very powerful worship ministry systems. The 12-Month Worship Leader Coaching Network will help you identify and overcome the Seven Challenges of a Worship Leader and build the systems necessary to lead a healthy and growing worship ministry. Maximize the financial resources in your Worship Ministry while teaching God-honoring Stewardship practices to your worship team. You’ll join me in 12 monthly coaching sessions that you can fully participate in anytime 24/7. You will receive both the audio and video of each session, so your experience will be identical, no matter when you log in. 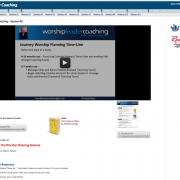 And the Worship Leader Coaching Network is provided in such a way that you can participate (and re-watch) at any time. Available now via a new on-demand, online module format, where you can participate at your convenience each month. Your experience will be identical, no matter when you log in. The Planning Challenge, part 2: Reduce the stress of week-to-week planning. PLUS: You will receive a customized Coaching Blue Print each month that gives you specific next steps! Everything of value in life requires an investment (just think about the instruments you own). The same is true for this Coaching Network… though we have tried to keep the investment as low as possible. But remember, you are receiving thousands of dollars of resources, free passes to our seminars, email support and private consulting. At the same time, you are saving thousands of dollars in hotel, flight costs, rental car expenses, gas, etc. With that said, the Worship Leader Coaching Network is only $297 a month. You’ll find that is about the same as taking 3 key team members to one of the major worship conferences this year (registration, travel, hotel, meals). The training doesn’t end after 3 days… in addition to the 12-monthly session, you get audio MP3’s of each session, meaning you walk away with a library of over 24 hours of nuts-and-bolts practical systems to build a health and growing worship ministry and share with the key leaders in your church. HURRY – BONUSES ENDING SOON! week while reducing your week-to-week Sunday stress! Monthly online sessions – hands-on coaching from Jason Hatley on all Seven Challenges of the Worship Leader. Regular Group Q and A calls to ask your specific questions. 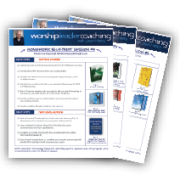 Over $2,320.20 in FREE resources from Worship Leader Insights PLUS special discounts on any new resources. Unlimited email access to Jason and the WLI team. A monthly environment where everyone is focused on a Kingdom agenda. The chance to grow and take your worship ministry to the next level!